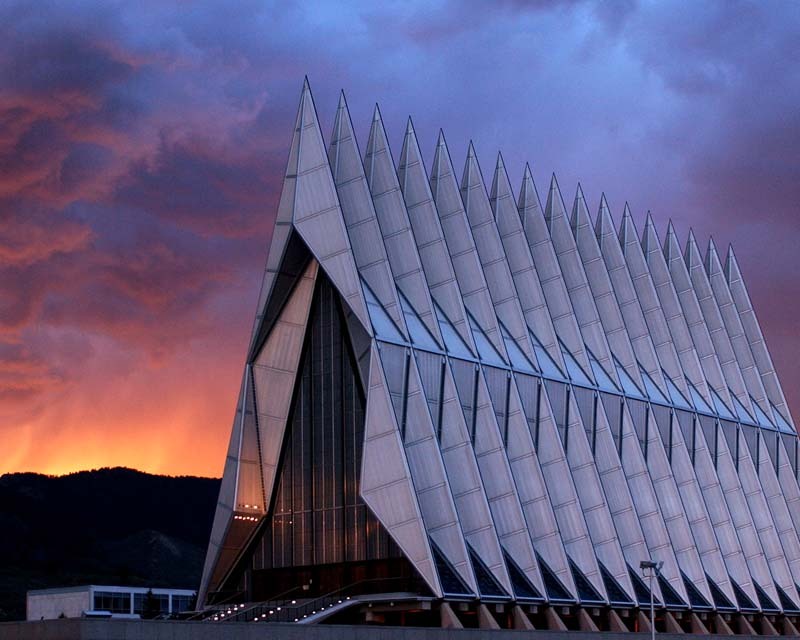 Are you moving with the military to Colorado Springs? (Click here for my offers for relocating military) Odds are you know people here already and they can probably give you some pretty good pointers on where to live – where to find the best schools in Colorado Springs, the most walkable neighborhoods, midcentury modern homes, houses with views. But if you know you don’t always see eye-to-eye with your friends who moved here ahead of you, or if you don’t really know what to expect, here is a little guide to PCSing to Colorado Springs. Colorado Springs has a rich military community. As home to the Air Force Academy, Peterson Air Force Base, Schriever Air Force Base and Fort Carson Army Base, we are a military town. This is undoubtedly one of the best places in the world to be stationed. The weather is fantastic with 300 sunny days a year, mild and dry seasons and few bugs. Colorado Springs has nearly all of the amenities of a big city without the traffic and congestion. Depending on how involved you get and where you live, it’s easy to find a sense of community here. There’s no wonder so many people from the military decide to stay or return after they retire. Colorado Springs is home to many diverse and appealing neighborhoods. I have included some descriptions below that will help you get to know the area, so you might be able to narrow your search. Visit any city in the world, and downtown is a draw. Colorado Springs is no different. The corner of Pikes Peak and Cascade avenues has been the center of the region since General William J Palmer founded the city in the 1870s. Downtown dwellers walk to restaurants, bars, theaters, climbing gyms, the YMCA, church, and work. They can also run or bike on a cohesive network of downtown trails. However, there is little residential development in the heart of downtown. A smattering of lofts above downtown retail sell north of $400,000. Blue Dot Place, a new apartment community at Nevada Ave. and Costilla St., offers 33 luxury apartments between $900 and $1,600 per month. It is the first new apartment community downtown since the 1960s – but not for long. There is a new apartment complex with more than 150 units under construction on the corner of Wahsatch and Colorado avenues. On the east side of downtown, the Shooks Run neighborhood boasts tree-lined street after tree-lined street of character-filled homes built in the early 1900s. Homes there range in price from just under $200,000 for small fixer-uppers into the $400,000s. North of Uintah Ave., the Historic Old North End awes visitors and locals alike with gorgeous, well-maintained Victorian-style homes priced $300,000 to more than $1 million. Cross over I-25 toward the mountains to find West Colorado Springs. A mish-mash of early 1900s mining shacks mingle with Victorian-style mansions and modest midcentury utilitarian homes. Prices for small places typically fall just under $200,000, but most homes will still come in under $300,000. Just west of downtown Colorado Springs, historic Old Colorado City has gobs of character and soul. Tidy historic brick buildings line Colorado Avenue, which quaintly lit with old fashioned street lanterns. Hip local restaurants, coffee shops and rub shoulders with funky art galleries, boutiques and tourist shops. The small mining cabins built in the late 1800s are extremely walkable and usually ring in just below or above $200,000, depending on size and condition. Bigger and more updated houses in the area top $300,000. No two abodes in OCC are alike and they all seem to be characters unto themselves. The town is a vibrant bustling pedestrian mecca stuffed with bars, restaurants and tourist shops. Victorian-style homes flank the steep and winding roads that climb the surrounding hills. Manitou is home to the cog train to the top of Pikes Peak and the famously grueling Incline. Manitou real estate is some of the highest priced in the region. Homes range from 450 square-foot cabins to stunning Victorian mansions painted in bright gingerbread colors. And they start around $200,000 rising to more than $600,000. There is no rhyme or reason to the area known as Cheyenne Canyon. The road wind around in all directions and a big stone home built in the early 1900s can sit proudly next to a bedraggled 1980s duplex. The area is woodsy with a pleasant creek running nearby and easy access to world class hiking. It’s alsoquickly becoming one of the hippest and most walkable areas since the Ivywild Elementary School was repurposed as home to Bristol Brewing along with a bar, restaurant, co-working space, whisky distillery tasting room and bakery. The Colorado Springs Urban Renewal Authority recently approved funds for revitalization projects along South Nevada Ave. Developers are now actively building new townhomes, apartments, condos and hotels. Homes in this area vary dramatically in size, style and price. On the east side of Nevada Ave., small 1950s ranch homes in Stratton Meadows sell in the neighborhood of $160,000. On the west side of Nevada, a little 1960s house can sell in the low $200,000s, a funky modern home with unique architecture can fetch $400,000, and one of the new townhomes will probably sell over $500,000. Just west of this area, Skyway boasts a high concentration of sprawling midcentury modern ranchers ranging from $400,000 to $600,000. The Broadmoor is an iconic property – the state’s only 5-star resort. It draws movie stars and royalty and offers immense luxury at the foot of Cheyenne Mountain. The homes surrounding the Broadmoor are architecturally distinct, well constructed, tastefully decorated, and lovely in every way. Of course, this kind of luxury comes at a price. Homes priced under $1 million will need a lot of work. And it’s not hard to find townhomes and condos in the Broadmoor Resort itself priced over $4million. Surrounding the Broadmoor, there are some more traditional family neighborhoods, such as Broadmoor Bluffs, where you’ll find 3,000-square-foot two story homes in a more traditional style between the high $450,000s and $700,000. West of I-25, Rockrimmon and Mountain Shadows are tucked into the foothills. While these 1980s and 1990s homes don’t typically have views of the mountains (because they’re in the mountains), they do have good city views, great trail and open space access, plenty of trees and some fun rock formations. These are mostly family homes priced in the $300,000s and $400,000s. This area was built up between the 1980s and early 2000s with family homes. Plenty of chain restaurants flank the Mattress Firms, 24-Hour Fitness locations and big box retailers of suburban America for easy access to all you could need, including the city’s most successful indoor mall – Chapel Hills. Small neighborhood parks and playgrounds complement schools with good reputations and tract neighborhoods now old enough to have some mature trees grown up in the pleasantly fenced back yards. Homes range from the mid-$200,000s to the $500,000s. You will find some of Colorado Springs newest and nicest homes in this area. Most are production-built homes in cul-de-sac neighborhoods, but they’re close to the Interstate and all of the city’s newest amenities, including the Great Wolf Lodge water park resort, Bass Pro Shops, a massive bowling alley, indoor shooting ranges, and indoor go-cart racing. Homes start at more than $300,000 and rise to the high $500,000 and well beyond in the high-end planned community of Flying Horse. Want to feel like you live in the wilds of Colorado? Black Forest offers acreage, trees, and a sense of remote isolation. Yet, you’re never far from town, especially as town grows north and east. Here, 1970s cabins start in the low $300,000 but you can get big houses on big land in the $500,000 range and luxurious secluded mansions for more. These are both sweet small towns with their own identities and town centers. Close to gorgeous open spaces with miles of trails and quiet country roads, this area is awesome for outdoor enthusiasts. The towns’ proximity to the Interstate and their position beyond the northern edge of Colorado Springs traffic, makes Monument and Palmer Lake particular popular with Denver commuters. Prices range from the low $300,000 to the $600,000s. In the 1990s, Powers Boulevard was the sparse eastern edge of the city. Today, it marks the western boundary of some of the city’s newest housing. Production homes offer good value with lots of square footage for the money. As the city has grown, there’s little reason for most people to ever leave the area. Movie theaters, the minor league ball stadium and tons of restaurants and retailers make for an easy life. Homes tend to sell between the low $200,000s and the mid-$300,000s. For those who want to live in the mountains, Green Mountain Falls, Chipita Park, Cascade, Woodland Park and Divide offer the best setting. Home styles vary widely from little log cabins to modern mansions. Just about every house comes with some sort of view along with phenomenal access to outdoor recreation opportunities. The little towns have great local food, some local brews and plenty of good people. Houses range from the low $200,000s for small places in Woodland Park to more than $1 million for big houses on tens of acres. But most fall in between at $300,000 to $500,000. In towns, houses have municipal water. Outside of town, they often have wells or cisterns. This community south of Colorado Springs is close to Fort Carson Army Base. Historically a sleepy little bedroom community, it’s gaining more identity of its own with shops and restaurants. Most are the usual suburban spots you’ll find in most American cities, but there’s also an effort to revitalize the quaint little downtown. Homes here range from 1970s and 1980s family homes to brand new construction and farm houses on acreage. It’s one of few areas near Colorado Springs where nice family homes can still sell for less than $200,000. Even homes on land can still come in under $300,000. If you’re PCSing to Colorado Springs, I’d love to help you find the right home for yourself and your family. Please contact me today to learn more about what I can do to help relocating military.